Melvin Cyrus Shaffer: Born May 9, 1924 in Shinnston, West Virginia, a rural town with an economy centered on coalmines and oil fields. After Shinnston High School I attended Alderson Broaddus College at nearby Philippi, West Virginia. Photography had been my hobby and so in college I was able to work as a medical photographer at the Meyers Clinic Hospital in Philippi. 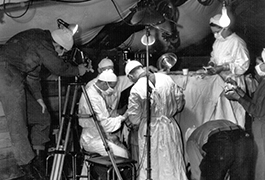 The United States' entrance into the Second World War delayed my college career, but not my involvement in medical photography. Enlisting in the United States Army at the Army Medical Museum, Washington, D.C. 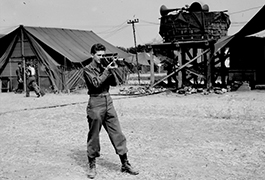 I received basic training as a medical corpsman at Camp Picket, Blackstone, Virginia, with further training in photography taking place at the Museum in Washington. I was transferred to Casablanca in August, 1943. 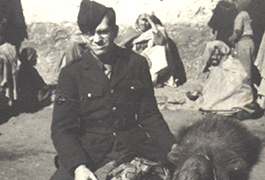 During my term of service in North Africa, my main responsibilities were: to photograph research projects in patient care for the United States Army; to prepare instructional materials dedicated to the new drugs sulfanilamide and penicillin; and to provide illustrations in plastic surgery for the French army. A variety of additional assignments took me to Casablanca, Oran, Marrakech, Tunis and, eventually, Sicily. Beginning in Italy, these assignments expanded beyond the development of instructional materials to encompass the documentation of the medical history of the war. 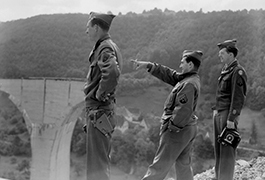 This ultimately involved making motion pictures of every major campaign in Italy, the invasion of southern France, and the final push across southern Europe to Dachau and ultimately to Berlin -- the emphasis always being on filming medical care, from the battlefield to the final disposition of a case. As the medical photographer present upon liberation of the Dachau concentration camp, I was responsible for photographing the handling of bodies, investigating sites thought to have been used for experimental medical procedures, and identifying photographs of human remains. My final assignment of the war was in Berlin where I arrived, under emergency conditions, on May 16, 1945 -- just a few days after the final surrender. This assigment was to photograph the remains of thousands of German citizens drowned in the subway system, which had been flooded in the final days of the war. 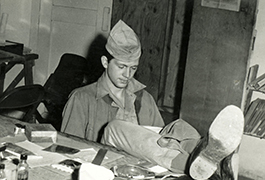 After returning to Washington in November 1945, I remained at the Army Medical Museum for several months, working with photographic and art materials as they came in from units from every theater of operations. Indeed, all of the "official" military photographs taken during the war remain in various military files; none of them are displayed here. These photographs, instead, are my personal work, taken to document the impact of the war on the civilian populations I encountered during my tour of duty. My military service was followed by a 37-year career in biomedical communications at the Medical College of Virginia, in Richmond, VA. I have also served as a consultant in Instructional Technology to the World Health Organization, the Pan American Health Organization and other organizations who have presented me opportunities to work in Medical Schools and Institutes worldwide. I have also served on various boards and commissions related to aviation, aviation facilities and international air traffic, and am a fully licensed commercial pilot. As I have spent a lifetime in communications in the medical field, I also serve on occasion as an adviser to film and television productions, particularly those related to war and the international arena. I have made every effort to research and identify the places described and pictured here, to ensure accuracy. But given the passage of time, and the fact that some relevant information is in inaccessible government files, I cannot guarantee that the documentation supplied with these images is completely error-free. Also, certain oil paintings done by Sgt. Fred Toelle are included with this material and are identified as such where they appear. It is also acknowledged that there are many duplicate or near duplicate photos included in this collection. They have been retained as part of the collection, however, so as to give a choice to those parties interested in the study of this material.